Representatives from over 100 Graduate and Professional School programs throughout the United States and abroad will be present to answer questions and provide information regarding graduate admissions, individual programs and their school. Ever contemplated, MAYBE going to grad school? Ever wondered if you should go to grad school? 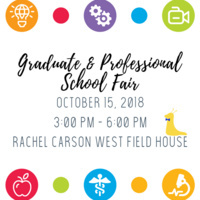 Come learn more about options and planning ahead for grad school.